AppleWorks users can safely upgrade to Mac OS X 10.6 (Snow Leopard) and be assured AppleWorks will continue to function as before. 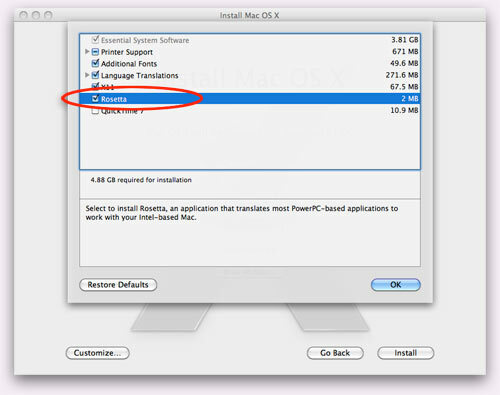 However, running AppleWorks under Snow Leopard requires that you install Apple's "Rosetta" software when you upgrade to OS X 10.6 or the first time you launch AppleWorks after upgrading to Snow Leopard. Apple calls Rosetta "...the most amazing software you'll never see." It's software that lets you use applications such as AppleWorks, which were designed to run on PowerPC-based Macs, to launch and run on Intel-based Macs too. Since Snow Leopard only runs on Intel-based Macs, all AppleWorks users running Snow Leopard must install Rosetta before they can run AppleWorks. Insert the Snow Leopard installer DVD into your Mac, and launch the installer. Select the hard drive where you want to install Snow Leopard. The first time you try to launch AppleWorks after upgrading to Snow Leopard your Mac will automatically install Rosetta if you chose not to install it when you upgraded. Make sure you are connected to the Internet when you launch AppleWorks that first time. Your Mac will display a dialog box asking if you want to install Rosetta. Clicking "Not Now" stops the installation process, and AppleWorks will not launch. Clicking "Install" downloads and installs Rosetta from Apple's servers so AppleWorks can launch and run. We've been running AppleWorks under Snow Leopard for several months now. Except for the initial install, Rosetta is the "most amazing software you'll never see."